Riker here, filling you in on the latest excitement. The peoples have been making a terrible mess in the kitchen lately. First they replaced a ceiling fan, and then they ripped out the back door! During the main part of that proceeding they quickly decided the "safest" course of action would be to lock us in the bedroom upstairs. Fortunately we still had a view of what was going on, but it wasn't nearly as much fun as getting in the way, and attempting to break out and investigate the back yard. Today was different. Vicki was in charge this time, and she felt up to the task of not only caulking, insulating, and painting the door, but also of keeping us from escaping into the great outdoors. I'm afraid she did too good a job. Not one of us made it out. But that was not for lack of trying mind you!! After all, there was a pretty interesting character on the other side of that door sill, a squirrel Vicki has named Muffin. (Who names a squirrel Muffin? Nut Case maybe, but Muffin?) Anyways, this silly squirrel wanted in the house for some crazy reason, and we obviously wanted to get to the squirrel. Yep. It was a pretty fun day. Tool Time with Muffin movie. Here is a picture of Muffin checking out Vicki's tools. The question has been asked "What kind of pet food do you give your cats?" Contrary to a wide spread rumor, we do not eat the family fish (further studies have discovered that those fish died of old age) or the family birds for that matter. The peoples give us Science Diet brand dry cat food. A mixture of the "Advanced Protection Senior Formula" and "Feline Oral Care." We really love the flavor of the Senior Formula, but we like the Oral Care too. We occasionally get the rare treat of a can of tuna, but that usually only happens at Christmas or birthdays. A surveillance camera caught me trying to mooch a cheese puff from the lady. 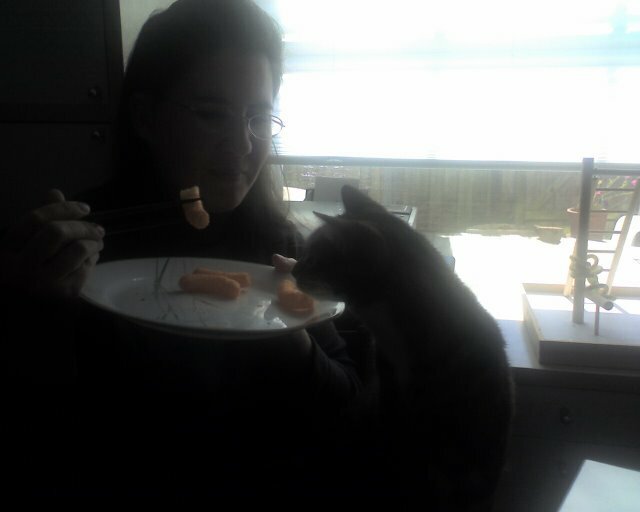 Isn't she smart to be eating them with chopsticks? Alright, so I still can't make it happen consistently, but I'm working really hard on being able to. Chalk it up to being a mechanical genius I guess. Oh, and did I mention that I have had a breakthrough with the whole red light toy thing? Yep. I know where it comes from... But, back to the copy machine. Here I am hard at work studying the keyboard. Always remember it is important to know where your "Ok" and "Cancel" buttons are. Socks here reporting on the mysterious death of the second fish to die in the Ashton household in the last two months. Maybe it isn't too mysterious since they were both about the same age. Alice was a white goldfish that had been part of the family for nearly three years. She has left her long-time friend Hugo, an orange goldfish, as sole survivor. Alice, you will be missed. All of us enjoyed many happy hours watching you swim, tantalizingly, just on the other side of the glass. Beth (the peoples' daughter) has been sick. She got to watch a movie tonight and that was fun. She was nice and warm, and of course the computer was warm. I chose the best seat in the house of course. I am ready to pounce on that moving picture if I need to. Oh, Riker and Socks want you to know that's them in the background. In the absence of Frank, we have taken to circling the other fish tank in the house. After a great deal of surveillance, we have surmised that this one has a cover. That is one pond we will not be drinking out of anytime soon. However, I think its inhabitants, Hugo and Alice, are feeling sorry for us. Notice the play of light through their fish tank directly onto our drinking water. You can see them taunting us with their shadows on the floor. Our water still doesn't taste like fish, but the effect is nice.